A fittingly tough final day, and the weather finally feels Mediterranean – sunny and hot. Leaving Marvejols, I follow the river downhill for 15 miles before having another climb to get back to the level of the Massif. But ahead of schedule I crest over the peak down to Sévérac-le-Château. Sadly there’s no time to stop as I have to carry on for lunch at Millau, where Norman Foster's spectacular viaduct spans the valley. As the bridge comes into view it really is a stunning sight and the ride down into the town feels worth the inevitable slog up the other side. I stop for lunch in the shade before braving the sun and heat. The road up the other side is long and hot, but thankfully the gradient isn't too horrible - and it gives me a chance to get a decent photo taken. An English honeymoon couple very kindly take my picture and promise to email it to me on their return home (as you can see, they lived up to there promise). Up here the plateau is barren and alien, more like the American badlands than my image of southern France and I travel through Templar settlements and more hills. 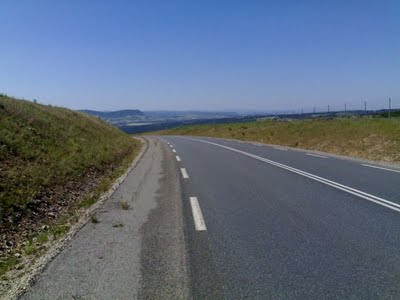 Finally there's a long descent towards Gignac and the final hard 20 miles to Montpellier. 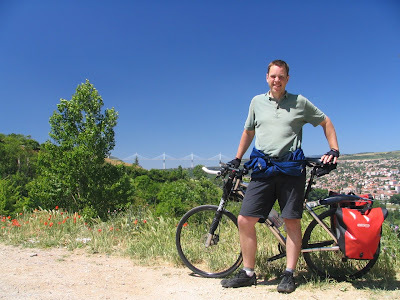 Unfortunately I'm late and I can't find any water, so I arrive (in a pretty grizzled state) just in time to meet my wife Clare, collect the hire car and drive to the gîte we're staying in for a week in St-Rémy-de-Provence. In total, I cycled 962.22 miles in 9 days, drank plenty of wine, ate a lot of nice meals and, while it hurt a bit, that was more than outweighed by beautiful countryside and wonderful people.